Managing a project carries complex concerns, not always found in traditional management. This workshop enables participants to learn and practice the tools and techniques needed in the Project Manager/Leader roles. The Best Practices for negotiation; communication; risk management; change management; and coordination between the Project and Management, Clients/Users, Team Members and Support Groups are covered in great detail. The course enables participants to identify and execute appropriate planning, organizing and controlling steps for projects, while ensuring Quality, the first time. This program is for anyone managing a portion or entire project in an organization (hierarchy, matrix or global task force), with shared or part-time resources, all with shifting priorities! This workshop also includes tips and techniques for making your projects ‘greener’. If formal ‘greeness’ is needed, see TSE050 GREEN PM (The Total Systems “4-5-6” Approach). Upon completion, participants involved with PMI® and the Project Management Institute’s Project Management Professional (PMP) program, are awarded 24 PDUs or Contact Hours. • Understand the management issues and techniques needed in Cross Functional-Task Force, Matrix and Hierarchy project teams. • Understand the use of project software tools to help Plan, Organize, Schedule, Control, Track and Report projects. Instructional methods for this course are lecture, discussion, detailed case study workshops and presentations. Upon request, demonstration and use of Microsoft Project™ is included in the program as are references to the PMI® PMBOK (Project Management Body of Knowledge) 5th Edition, AGILE and Waterfall methodologies, Six Sigma, in-house Standards and Policies, and ISO9000. For more information please call 212 776 6239. 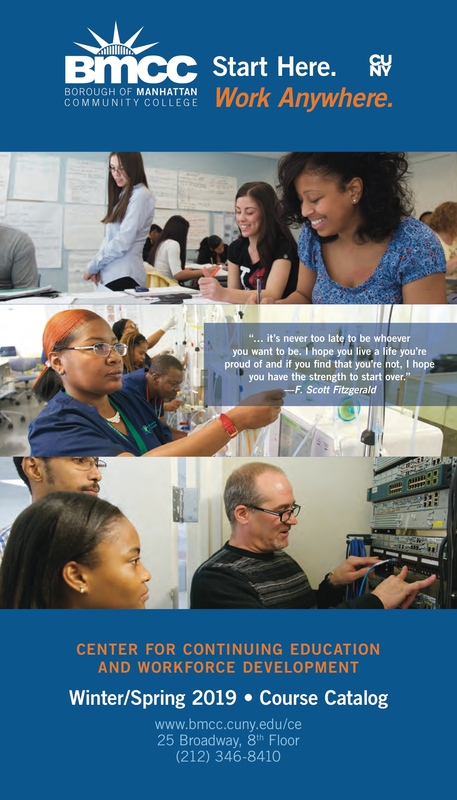 Here are the answers to some questions that people frequently ask BMCC Continuing Education. If the answer to your question is not here, or if you need more information please call 212-346-8410/8420 between 8:30 a.m.-7:00 p.m., weekdays or email ace@bmcc.cuny.edu.